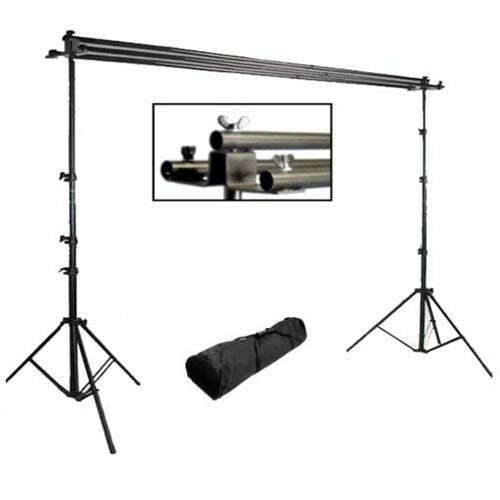 The Triple Play Professional Backdrop Support System is lightweight, heavy-duty and extensible for almost any application. We took our best selling support stand and made it better. This is the background support system that the professionals use. Holds up to three muslins--No more wasting time, changing backdrops. It will hold canvas, muslin or paper. Simply flip the backdrops to change your color. Rated for our heaviest muslins, this support system is quickly gaining ground as a new crowd favorite. Since it weighs only 15 lbs and takes less than 5 minutes to set up, our background support system is the ultimate in portability and makes it the ideal solution for on-the-go wedding photographers, outdoor or on-location shoots or can help to complete your studio. It easily holds large muslins as well as heavy rolls of paper, yet folds down for easy storage. This is a great solution for a cramped home studio or any photographer who values the ability to assemble and break down quickly without breaking your back to do it. Again, we offer the best prices for the highest quality equipment and we guarantee your satisfaction! Stands extend up to 8'6"